Producing defective products is not an option for global manufacturers. 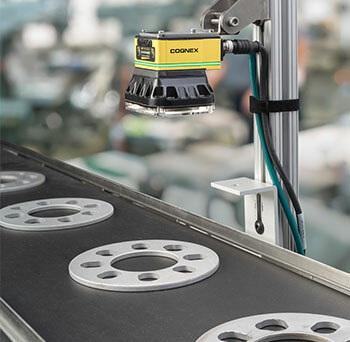 By deploying machine vision with the aim of defect elimination right down the production line, our customers have been able to reduce scrap, reduce capital costs and increase customer satisfaction by minimizing product recalls. All factors having a positive impact on their bottom line. Bottling - eliminate defective products before they cost you money - Package fill level tolerances are very narrow when it comes to under-filling and over-filling. A large beverage manufacturer in the US is inspecting bottles at a rate of 375 per minute. Bottles that haven’t filled properly or have had the caps put on badly must be rejected. By using In-Sight 2000 on their line, defective bottles are immediately rejected. Production rates are maintained and cost-efficiencies achieved by eliminating defective products before they reach the client. The savings per year coming from the elimination of under-filled bottles is estimated at several hundred dollars a day adding up to over $100,000 per annum. Coupled with savings from the reduction of costly product returns and dealing with customer complaints, the company managed to save over $175,000 ensuring that their vision investment had a very positive impact on their bottom line. Find faulty products before they get into the supply chain – In the food and beverage industry vision-based Optical Character Verification (OCV) has become an essential tool for verifying human-readable batch and expiry dates are applied correctly. Using OCR/OCV, faulty products can be identified and removed from production before getting into the retail supply chain. A large Asian manufacturer servicing the food industry uses In-Sight OCV readers in order to verify the characters on food products and assure their correct distribution. By assuring complete product tracking within the production process, the company can avoid costly product recalls and avoid false rejects, vital when supplying food industries in the public sector. Cost of product recalls in the past were several hundred dollars a day. By eliminating this the company was able to save thousands of dollars per year and saw a return on their vision investment within months. Chocolate treats need to reach their consumers in perfect shape - A biscuit manufacturer needed to eliminate packaging defects at a production speed of up to 400 products a minute. At this speed even just a few seconds of defective production means several dozen rejected packages. This has a negative effect on the production flow. This kind of waste could add up to several hundred dollars a day which is a significant amount per year. The company saw a return on their vision investment within 3 months. For lean manufacturing - In-Sight 2000 is used to verify the exact number of bottles contained in a crate. Instead of having to use multiple sensors which are inflexible, the bottler was able to use one single In-Sight 2000 to inspect the entire batch reliably. By replacing photo electric sensors with just one In-Sight 2000 the company could be sure of cost savings. This is vital for small or medium sized companies who need to error proof their production and maintain a lean process.